This page will help you organize your EndNote Web references in groups. Groups allow you to easily sort your references by class or assignment, and allow you to generate bibliography pages. 1. Check the sources you wish to add to a new group. 2. 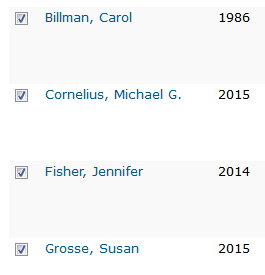 Click the "Add to group..." dropdown at the top of the list of references, and choose "New Group." 3. Enter a name for the group and click OK.
1. Check the references you want to add to the group. 2. 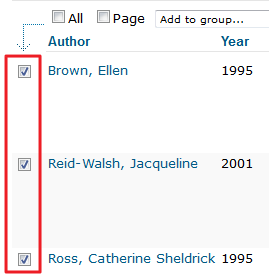 Click the "Add to group" dropdown at the top of the list of references, and click the group you wish to add them to.